One of the most important factors to consider when handicapping the Kentucky Derby is the pace of the race. Correctly determining how fast or slow the pace will be can be the key to finding the winner, although doing so is easier said than done. All you have to do is look at what happened in the 2013 Derby, when the combination of adding blinkers and racing over a sloppy track caused Palace Malice to run off through fractions of :45.33 and 1:09.80. Who could have predicted that? The 2017 Kentucky Derby presents an interesting quandary since there are hardly any horses in the prospective field that have done their best running on the lead. The few that have won races in gate-to-wire fashion--Always Dreaming, Gormley, Irish War Cry, Fast and Accurate, and Battalion Runner--have also shown the ability to rate off the lead, and in the case of the first four, they've been more effective coming from behind. Another that has run well on the lead is the Santa Anita Derby runner-up Battle of Midway, but the only reason he set the pace in the Santa Anita Derby is because an inside post draw forced his hand--he had previously been successful coming from off the lead. But while the 2017 Derby may lack any stand-out front-runners (with the possible exception of Battalion Runner), it certainly isn't lacking in horses that like to stalk the pace. In addition to the colts mentioned above, Classic Empire, Irap, Thunder Snow, State of Honor, and Malagacy (who may not run) have all shown a desire to race close to the pace. In other words, more than half of the prospective Derby field has shown a tendency to race on or near the lead, leaving Girvin, Gunnevera, Practical Joke, J Boys Echo, Tapwrit, Hence, McCraken, Patch, Untrapped, and perhaps Lookin at Lee and Sonneteer (if they make the field) to comprise the group of closers. In my opinion, this setup could lead to an interesting pace scenario in the Kentucky Derby. I don't think the pace itself will be all that quick--perhaps :46 3/5 and 1:10 4/5, maybe even a little slower--but I suspect a large group of horses will have a part in that pace, making the post position draw critical. After all, with eleven horses showing a desire to race on or near the lead, some are bound to wind up in less favorable positions, which could eliminate their chances right from the start. Therefore, my gut feeling is to favor versatile horses that have the speed to be involved from the start and have drawn outside post positions, allowing them to settle into stride and avoid getting stuck in traffic or trapped in tight quarters. I believe this Derby will be won by a horse that can stay close to a decent pace, then blow the race apart with a strong move in the fourth quarter-mile, giving them the lead (and a possibly insurmountable advantage) at the top of the stretch. I'm also not opposed to playing the fastest horse with an inside draw, as the possibility of securing the lead while saving ground would be a huge advantage for any horse talented enough to stay the distance. Wouldn't it be rather challenging to run down a horse like Irish War Cry if he secured the lead on the rail through a modest half-mile fraction? One other factor that warrants consideration is the possibility that Practical Joke will race in blinkers. Although he has never previously worn blinkers during a race, he is expected to wear them during a workout tomorrow morning, after which a decision will be made on whether he'll wear them in the Derby. The addition of blinkers might not have an impact on Practical Joke's running style, although there's always a chance that it could sharpen his speed and cause him to race closer to the early pace than he has in the past. Memories of Palace Malice do come to mind, though I'd be surprised if the results with Practical Joke are anywhere near that dramatic. To give you an idea of how the Derby pace tends to unfold, here's a chart detailing the quarter-mile, half-mile, six-furlong, and final half-mile fractions from the last ten Kentucky Derbies; note that the 2009, 2010, and 2013 renewals were contested over sloppy tracks. Under the column "First 1/2," I have also included in parentheses the number of lengths by which the eventual winner trailed the leader at that point in the race. Now it's your turn! How do you think the pace of the 2017 Kentucky Derby will unfold? 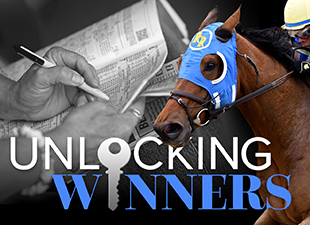 The Unlocking Winners Road to the Kentucky Derby Handicapping Challenge is back for a third consecutive year! Please be sure to post all entries, prime horses, and stable additions on the official contest page. Thanks, and enjoy the racing!